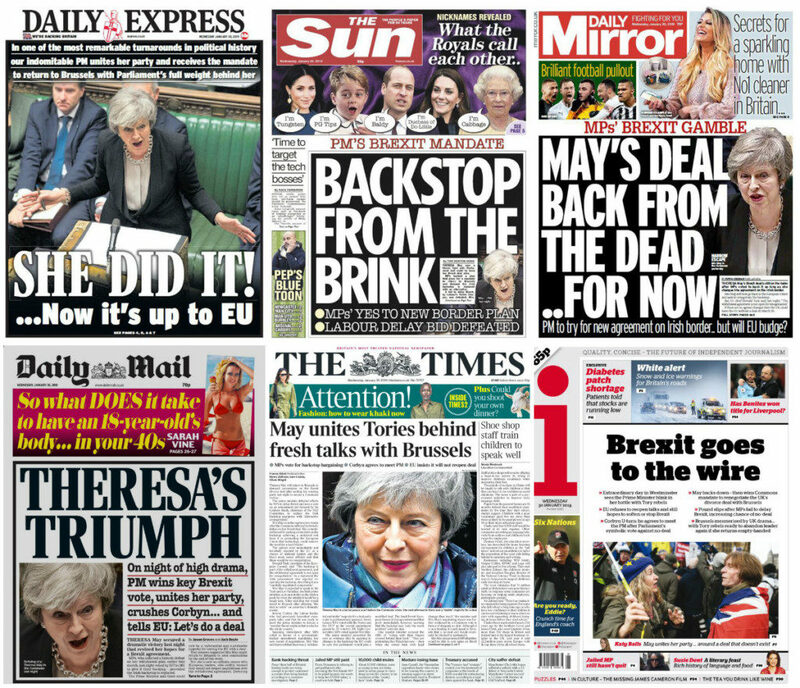 Any idea what the tabloids made of yesterday’s vote in which MPs despatched the PM to Brussels to ask the EU to renegotiate the Withdrawal Agreement – you know, that deal she agreed and her peers thought was crap; the one the same MPs voted down by a record margin of defeat for a serving Government a whole two weeks ago? Take a look. The tabloids it. They love “Theresa” (Mail), “She” who must be obeyed (Express) and a pretty chipper public school “May” (Mirror). Theresa the Wheezer is limping to the finishing line. Theresa the Squeezer is eking out every last drop of credibility for her fudge. Or how about any one of Caesar, freezer, pleaser, teaser, appeaser, bumfreezer, displeaser, misfeasor, tranquilizar and any other pun the tabloids could have employed to ridicule the painfully absurd state of British politics? Remainers and Brexiteers like to promote themselves as opposing sides in a frenzied, thrusting debate. But both camps are united only in their introversion, a chamber of inward looking dullards seeking truth in a solid past and never daring to press on. Calls for a second vote are as steeped in nostalgia and insecurity as the Brexiteers they deride, for whom distance is always measured in yards and bad teeth are a national treasure. The tabloids must try harder. We get it: they want anyone but Corbyn, But the papers’ sappiness means we also get May. And that’s got us nowhere. Oh for a Leaver leader capable of embracing the vote and blessed with courage and an expansive outlook. But the loud, arcane Brexiteers left it to May, a Remainer, to cobble something together as they snarked and sniped from DJ booths, newspaper columns and the back benches, turning the simple act of writing a letter, something they must have dictated to a nanny, tutor or divorce lawyer hundreds of times, into a group therapy session they flunked. Sat across the way is Jeremy Corbyn, a monocular visionary so stuffed with contradictions and hypocrisy that Michael Gove, the MP who stabbed Boris Johnson in the back, managed to toss a wreath over the Labour leader’s frowning bonce and reel him in for a pasting. And that frown, the one Corbyn uses to portray, in his mind at least, deep thought and knowing but gives him the look of a confused viewer trying to work out how Dirty Den came back from the dead. So farewell, Theresa. Off you pop to serve the EU’s wonks the Parliament-backed Brady amendment, with its “alternative arrangements” to the Irish backstop. Best of luck. May’s shuffling back. Nigel Farage and Yvette Cooper can only look on approvingly.